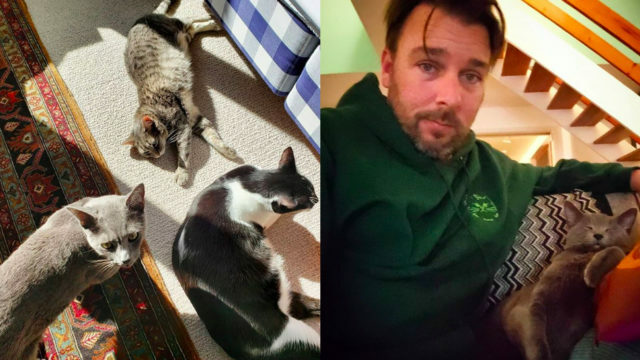 Choire Sicha is one of the internet’s foremost cat gentlemen, presently residing with William James, Peregrine (aka Perry) and Linden. He co-founded The Awl, which was regarded by many as the only good website. He’s also the author of Very Recent History: An Entirely Factual Account of a Year (c. AD 2009) in a Large City, which I think would be an interesting thing to read (or re-read) now, as it will hurtle you back to a very specific post-crash, pre-Instagram New York, and the lives of young gay men trying to make sense of it. These days Choire is the editor of The New York Times Styles section, and also an occasional advice columnist. Follow him on Twitter and Instagram! left: Linden, Perry, William James. right: Choire and Linden. Actual New York Times Cat Headline or Fake News? Cat-themed clothing: Is it ever fashionable? The answer may or may not surprise you, and in the end, Choire realizes he’s Anne Hathaway!